The Horizon Fitness T202 Treadmill is the middle sibling in a series of three. The two others are T101 and T203. Horizon T202 quite naturally offers a suitable middle ground between quality, features and price. It has an automated 12% incline with increments of 0.5 percent. It also offers built-in programs that include calorie goal programs and weight loss workouts. This model also features the Advanced Goal Center for your long term fitness plans that lets you chart out exercise for 31 days, which can be saved to an iPod to track better. The T202 is for anyone who doesn’t want to compromise on gym quality neither spend a premium. Horizon Fitness T202 Treadmill features the FeatherLight folding lift system that allows easy folding and unfolding of the machine. Storage of the treadmill is convenient because of its hydraulic shock that reduces the effort required to pack up. Best of all at full speed, the motor continues to hum its low electric tune, probably as audible as the speakers giving out white noise. It has 12 programming options, which we felt was a lot to play with. You can easily meet your fitness goals by taking advantage of the 1 to 31 day training program. And yes all workout data is automatically exported to the servers that are accessible from your iPod. Furthermore, the fact that your iPod gets charged as you run does add to its allure. Horizon Fitness T202 Treadmill has a powerful 2.5 CHP motor. It runs quietly at whatever speed you might want, from slow to full speed of 12 miles per hour. Its 12% incline provides a good range of workouts. In fact, there is a particular setting that randomly changes inclination with speed starting out slow and flat to make each day a new experience. The treadmill takes a bit of time to assemble, and because of its footprint, you should ideally assemble it at its ultimate resting place. It took us two to just get it finally tucked into the corner of our recreation room, better keep that in mind. The console is easy enough to read thanks to the 4-digit LED window with alphanumeric display. If it hadn’t been for the heavy nature of the Horizon Fitness T202, we might have actually given it a perfect 5. The belt with a running surface of 20 by 55 inches is well constructed and is 1.4 millimeters thick (read super-reliable). It provides comfortable stride at any speed, from walking to running. This treadmill also has a cushioned deck that offers comfort and convenience. It features the PerfectFlex Plus cushioning system, which can absorb the shock from impact and gives extra support that can reduce the strain on our knees and joints. One of the best features of this treadmill is the Nike + iPod solution that allows workout data to be automatically saved on the iPod. While not that tech savvy, presumably many other users found this feature a godsend. Did I mention that this treadmill has a built-in fan, too? Yeh, it’s silent, powerful, intelligent and now cool too! Powered by a 2.5 CHP motor. The running surface is 20 by 55 inches and its belt thickness is 1.4 millimeters. The incline is from 0-12% with 0.5 percent increments. Speed range of 0.5 to 12 mph. 12 workout programs to choose from. It can accommodate up to 325 lbs. weight capacity. The console has two 4-digit LED windows with alphanumeric display. The overall machine measurement is 70 x 30 by 58 inches. (L x W x H). Sonic Surround sound system made for iPod with full controls. The Horizon Fitness T202 Treadmill is designed and built for walkers, not for runners. Also, it takes 8 seconds to get an updated reading on the pulse meter. 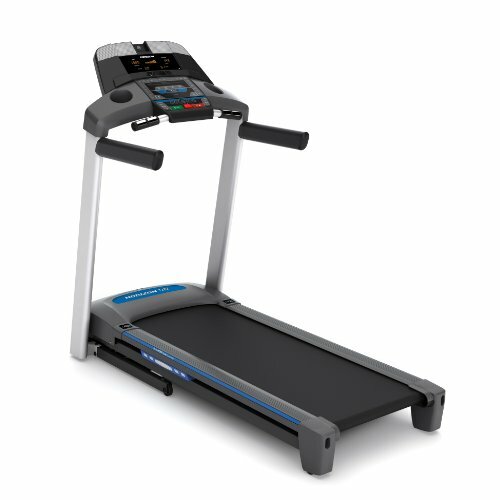 What I don’t like about the T101 is that it is a bit larger than competitor treadmills. Some reports of instability are also of concern. The Horizon T202 Treadmill is a good investment for any fitness enthusiast. The features like Nike + iPod workout tracking system along with the built-in sound system is great but it is the overall construction and performance that truly makes it worthy of the Horizon nametag. Though the small treadmill belt can be a problem for tall users with longer strides, it is still the best treadmill to start an exercise regimen for fitness or weight loss purposes from Horizon.